Checked by MF following Sophie Catley. 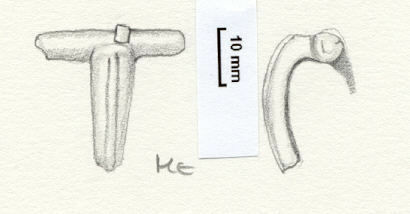 Sub-classification added: ''possibly T-shaped' following source record; dating completed [unamended]; drawing ref. added. Hattatt, R., 1982 Ancient and Romano-British brooches Sherborne: Dorset Publishing p.302,no.402. Upper part only, no pin or catchplate. Hinged. Central ridge on bow. Dolphin variant. Hinged, no pin or catchplate, upper half only. Rectangular cells on bow with traces of blue and yellow enamel.